Tomorrow’s Times has a poll of Conservative party members about the forthcoming leadership election, showing Theresa May ahead of the supposed favourite, Boris Johnson. Asked who would they would prefer as party leader May is on 36% to Johnson’s 27% (Andrea Leadsom and Stephen Crabb are both on 7%, Liam Fox is on 4%). Party members only actually get to vote on the final two candidates of course, and in a straight contest between Theresa May and Boris Johnson current support stands at May 55%, Johnson 38% – a seventeen point lead for May. The full tables are here. Theresa May appears to have had a good EU referendum campaign or at least, by standing a little aside from it her reputation has survived intact while most other Tory politicians have been damaged. When YouGov asked Tory members if they had positive or negative impressions of various politicians 72% were positive about May, up 4 from before the referendum. In contrast Boris Johnson was at 58% (down 18 since the referendum), Gove 63% (down 6), Sajid Javid 42% (down 8), IDS 54% (down 9), George Osborne 47% (down 21). She is also one of relatively few figures who is positively regarded by both those members who supported remain and those members who supported leave. Part of the turnaround appears to be the perception that Theresa May is better placed to unite the party – 64% of party members said this was one of the most important considerations (up twenty points since Febrary) and May has a thirty point lead over Johnson on who would be better able to unite the party (46% to 16%). Given the current political and economic situation, she also has a lead over Johnson on ability to handle a crisis (49% to 18%), taking tough decisions (46% to 18%) and negotiating with Europe (32% to 22%). Boris Johnson’s own strengths are still apparent though – he is seen as by far the best media performer and the candidate who best understands how to win an election. Both he and Stephen Crabb are ahead of Theresa May on who party members think would be most in touch with ordinary people. While the poll shows him losing in a May -vs- Johnson run off, they still suggest Boris would win in a run-off against Stephen Crabb (by 54% to 31%) or Liam Fox (by 52% to 29%). This is, of course, a very early poll – it was conducted between Monday and Wednesday, so before nominations opened or the final list of candidates was confirmed. Party members don’t yet know what pledges and promises the candidates will make, what their detailed stance will be on Europe or other key issues. For less well known candidates like Stephen Crabb many members won’t know much about them at all. As the race begins though, Theresa May has the early advantage. The Times have a YouGov poll tomorrow asking who people want to see as the next Conservative leader. Now, this is a question that I had got a bit bored of asking over the years: almost always Boris Johnson wins easily – he is the most recognisable of the Tory leadership contenders, obviously the most charismatic, and seems to have swung the trick of getting judged by the standards of a celebrity rather than the standards of a politician. However, in today’s poll he is pipped by Theresa May – 19% of the public think she would be the best candidate for the next leader of the Tories, 18% think Boris Johnson. To put this in context a similar question a week and a half ago had Johnson six points ahead of May, a fortnight ago Johnson was twelve points ahead of May. This is, I hasten to add, polling of the general public, not of the people who decide. It is the votes of Conservative MPs and the party members that actually count, and they may very well have completely different views. However – part of Boris’s appeal to the Conservative party is his supposed ability to reach out to voters, his charisma and his public popularity are one of his primary selling points. If he isn’t the choice of the wider public… well. If I were TNS or Opinium I would be rather annoyed today. Looking through social media, twitter and so forth there are lots of comments about the polls all being wrong and it being a terrible night for the pollsters, etc, etc. 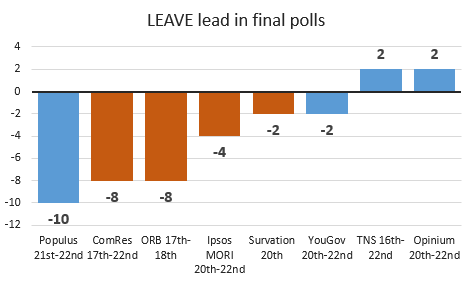 Both TNS and Opinium had final call figures of REMAIN 49%, LEAVE 51% – within a point of the actual result. Far from being a terrible night, they got it pretty much spot on, and should be getting congratulated. The polls in blue were conducted online, the polls in orange were conducted by telephone. Note that ORB and Survation’s fieldwork both finished a few days before the referendum, so one cannot rule out a change in support in the days between their fieldwork and the vote itself. Disappointingly for me personally YouGov’s final poll had Remain ahead, albeit, only by two points. Unlike in May 2015 though I’ve a good idea of what went wrong (the turnout model we used for the poll weighted down people who didn’t vote at the last general election, when in reality turnout ended up being higher than the last general election), which is something that can be worked on. During much of the campaign discussion of polls focused on the gap between telephone and online polls. The division is, as ever, really not as simple as that – Populus showed the largest Remain lead and it was conducted online, until they stopped polling a few weeks from the referendum ICM’s telephone polls were showing figures as Leave as their online polls. However, the general trend was clear – online polls tended to show a closer race than telephone polls; online polls tended to show it neck-and-neck, telephone polls tended to show Remain clearly ahead. Many media commentators bought into the view that phone polls were “better” in some way, and should carry more weight than online polls (a debate I sought to avoid as much as possible, as there really wasn’t good evidence either way). I suspect this has played into the perception that the polls as a whole were wrong. If you’ve spent the last few months focusing on the polls showing a solid leave lead, and playing down the polls showing a neck-and-neck race, then you’d have been very surprised by last night. The gap between online and phone narrowed during the campaign, and that was largely due to changes in online polls. The debate about the gap between phone and online polls has focused largely on potential differences in sampling – studies like that of Matt Singh and Populus found that people gave different answers to questions on things like immigration and national identity in online and telephone polls, that people in online sample seemed to be less socially liberal than people in telephone samples. In response several online pollsters adopted things like attitudinal weights to make their samples more like phone polls… perhaps, in hindsight, it should have been the other way around. Since the error in the polls in 2015 I’ve said that the problems won’t be solved overnight. Pollsters are experimenting with different methods. Some of those things will work, some will not – it is a learning process. The record of polls conducted online is getting more promising – the performance of the mostly online polls at the May elections was mostly good, and most of the online polls for the EU referendum were either good, or at least only a few points out. While the problems of 2015 are probably not entirely cured yet, online companies are showing clear progress, for some phone polls there is clearly still work to be done. It’s the eve of the referendum, so we have a flurry of late polls. Later on this evening we will have figures from ComRes and YouGov (Ipsos MORI’s final poll is normally in the Standard, so will probably be out tomorrow morning), already we have final figures from TNS and Opinium. Opinium have topline figures of REMAIN 44%, LEAVE 45%, Undecided 9%. Leave are ahead by the tiniest of margins, but clearly the two sides are within the margin of error of each other. Full tabs are here. TNS‘s final referendum poll also has Leave ahead, this time by two points. Topline figures here are REMAIN 41%, LEAVE 43%, Undecided or won’t vote 16%. Note that unlike TNS’s last few polls their headline figures here are NOT weighted for turnout – with their turnout model they would have been Remain 42%, Leave 49%. Full tabs are here. I will update later once ComRes and YouGov publish. In the meantime both of the non-British Polling Council companies who produced more unorthodox polls last week have produced updated figures – SurveyMonkey have final figures of REMAIN 50%, LEAVE 47%; Qriously (the company sampling via smartphone ads) has final figures of REMAIN 37%, LEAVE 51, Don’t know 12%. Again, make of that what you will. ComRes for the Daily Mail have topline figures of REMAIN 54%, LEAVE 46%, a widening of the Remain lead after their last poll showing Remain and Leave within a point of each other. ComRes have reallocated don’t knows based on respondents’ views of the impact of Brexit on the economy, which looks like it boosted Remain by a point or so. Full tabs are here. YouGov for the Times have topline figures of REMAIN 51%, LEAVE 49% – so considerably closer. The YouGov poll now includes a turnout weight (though it made no difference at all to the topline) and a squeeze question, which also bumped Remain up by a point. Full tables are here. On YouGov’s website they’ve also updated the multilevel regression and post-stratification (MRP) model of referendum voting using all their data, which they first posted earlier in the week, that is now also pointing towards a small lead for Remain. Note that all four of the polls here include Northern Ireland. Most general election polls don’t, and so polls during the EU campaign have varied on whether they do or do not include NI – all these four do. UPDATE2: Two more polls published on the day itself. Note that these polls were conducted before polls opened, they are only published today. It’s illegal to publish polls conducted on the day until polls close, but perfectly fine to publish polls conducted before polls opened. Ipsos MORI‘s final poll has topline figures of REMAIN 52%, LEAVE 48%, putting Remain back ahead after a leave lead in MORI’s penultimate poll. MORI have slightly changed their turnout filter for their final poll, basing it on how likely people say they are to vote and how important they say the result is to them. Full tabs are here. Finally, and a little surprisingly, Populus have produced a final call poll. Populus’s Andrew Cooper has been working with the StrongerIn campaign so the company haven’t been putting out regular polls during the campaign, but they have produced final topline figures of REMAIN 55%, LEAVE 45%. Unexpectedly given the topline results the poll was conducted online (completely messing up that “phone & YouGov saying in, other online saying out” pattern). Populus haven’t released tables yet, so I’ve no details of the weightings or adjustments used. Two more polls have been released during today, both showing the race essentially neck and neck. Survation have released their final EU telephone poll for IG Group (not sure if that’s their final poll for the referendum itself, or just the final one for IG). Topline figures with changes from their weekend poll are are REMAIN 45%(nc), LEAVE 44%(+2), Undecided 11%(-2). Full tabs are here. Surveymonkey also released new online figures this morning (for those unfamiliar with Surveymonkey as pollsters, I wrote about them here). Their topline figures in the new poll, conducted Friday-Monday are REMAIN 48%, LEAVE 49%. Changes are from their poll last week. I don’t think any polls are due in tomorrow morning’s papers, most of the remaining final calls will presumably be showing up tomorrow afternoon or evening. Finally a note about the ORB poll this morning. As regular readers will know, ORB figures have been a little confusing over the campaign – they have published two sets of figures, one for those 10/10 certain to vote, one for all voters. ORB have regarded the latter as their main figure, but the Telegraph have focused on the former. For their final call though ORB have been much clearer and put up an explanation on their site, with final projections of REMAIN 54%, LEAVE 46% – based on those certain to vote, and an assumption that the remaining don’t knows will split 3 to 1 in favour of Remain.